Pingleswar Ardhnareswa Devalaya (पिंगलेश्वर अर्धनारीश्वर देवालय) is one of the ancient Shiva Temple of North Bank of Brahmaputra. It was constructed by King Indrapal of Pal dynasty around 11-12 CE. Ahom King Shiva Singha has rebuilt it in 1661. Following archaeological servery in 1959 temple was reconstructed again in 1962-70. Last jolt to the temple was in 2009 earth quack, since than it is prohibited to go down the Sanctum (गर्भगॄह) which is deep underground like all ancient temples of Assam. Shiva Ling was flooded with water after incessant rain in this monsoon. 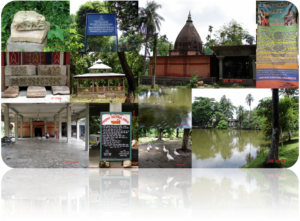 It is used by devotee of the surrounding village and well maintained by Govt. There is an Archaeological museum which was closed on Sunday when we visited. Pingleswar can be reached from Guwahati by boat from fancy bazar to cross Brahmputra river and then by tracker to Bezra about 20Km, or take any bus to Tejpur and drop at Bezra, from here auto rickshaw is available to reach devalaya which is about 4-5Km distance.